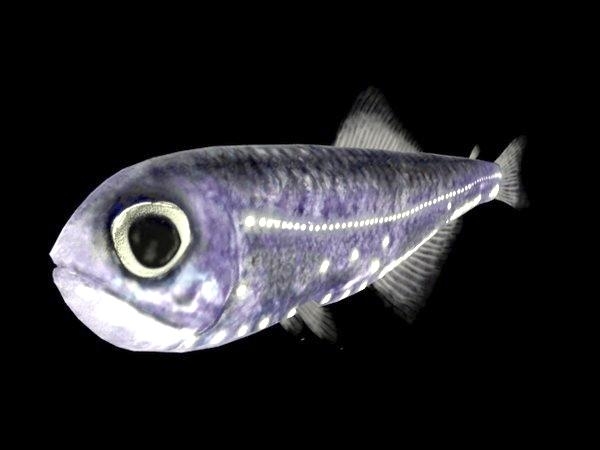 The Lanternfish is a deep-water fish that gets its name from its ability to produce light. The light is given off by tiny organs known as photophores. A chemical reaction inside the photophore gives off light in a chemical process known as bio-luminescence. It is the same process used by fireflies and is similar to the chemical reaction inside the green light sticks that children use on Halloween. 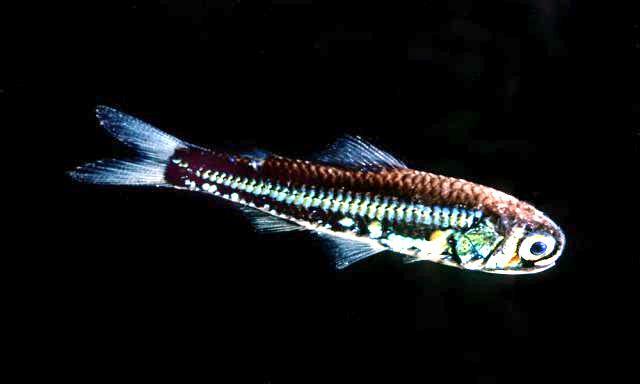 The photophores are located on the fish’s head, underside & tail. 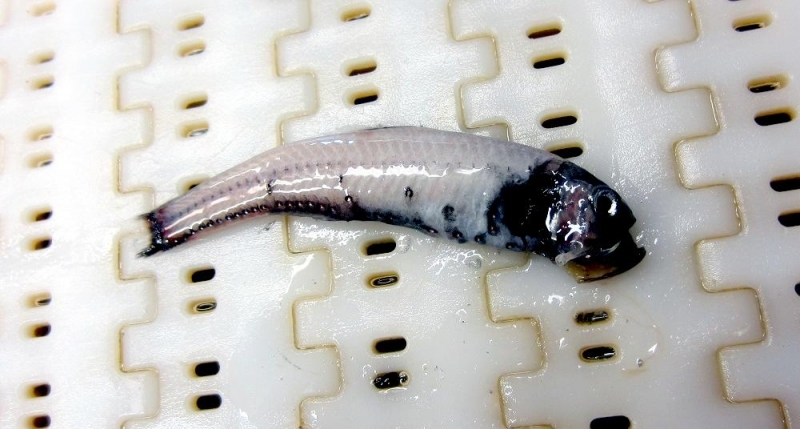 It is believed that these light organs are used to attract other small fish on which the Lanternfish feeds. 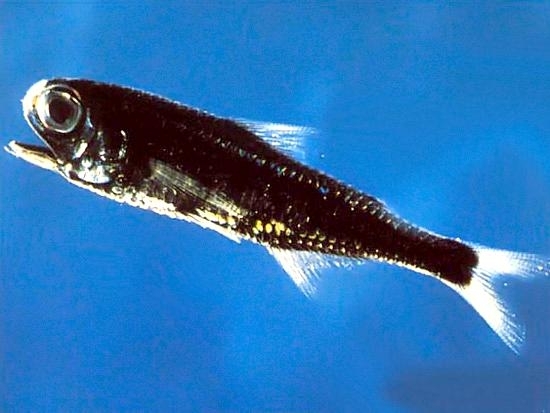 They may also be used to signal other Lanternfish during mating. 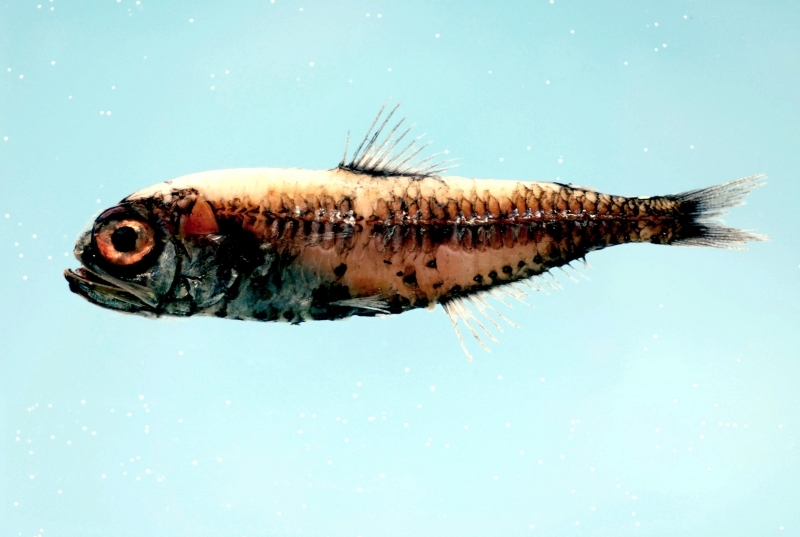 There are over 200 different species of Lanternfish in the deep-sea. In fact, they are thought to be some the most common deep ocean creatures. 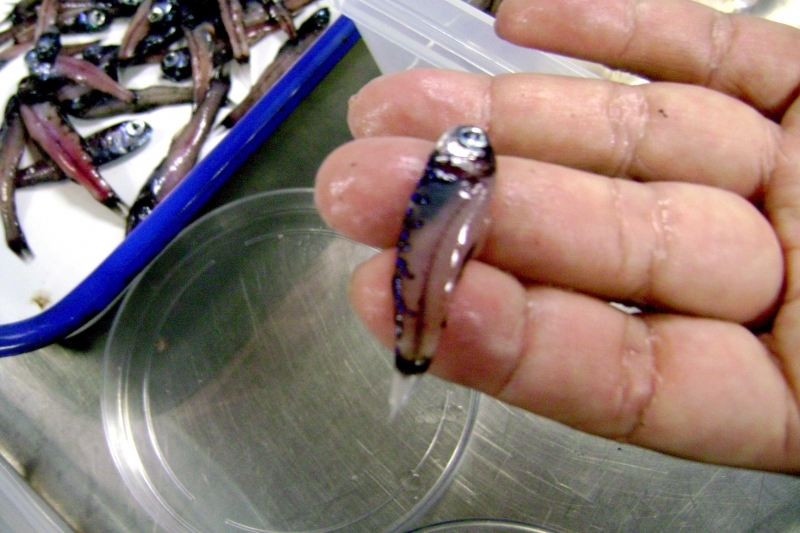 Sampling by deep-sea trawling indicates that Lanternfish make up as much as 65% of the deep-sea biomass. 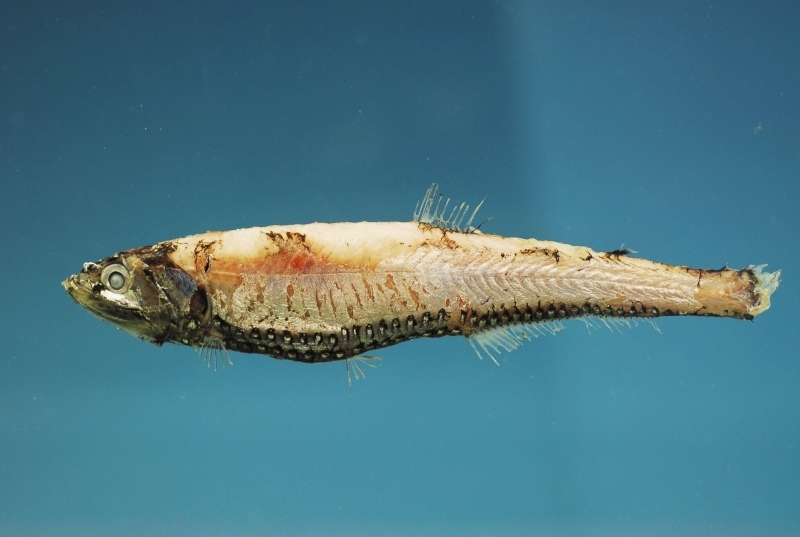 Lanternfish typically grow to a length of up to 6 inches (15 centimeters), although some species can range in size from 1-12 inches (2-30 centimeters) in length. 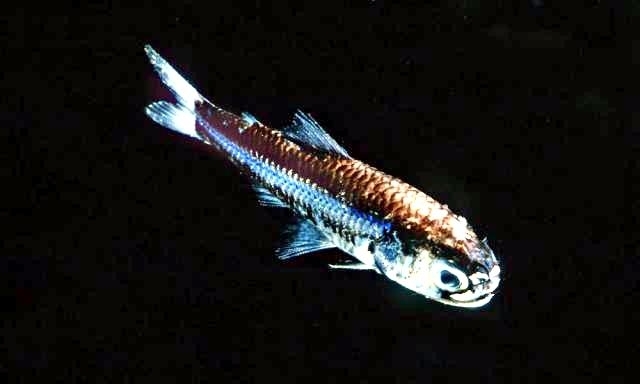 They have a very slender, compressed body covered with silvery scales and relatively small fins. They also have a large, round head and large eyes. Large eyes are common in deep-sea creatures as they help to collect as much light as possible in the eternally dark waters. 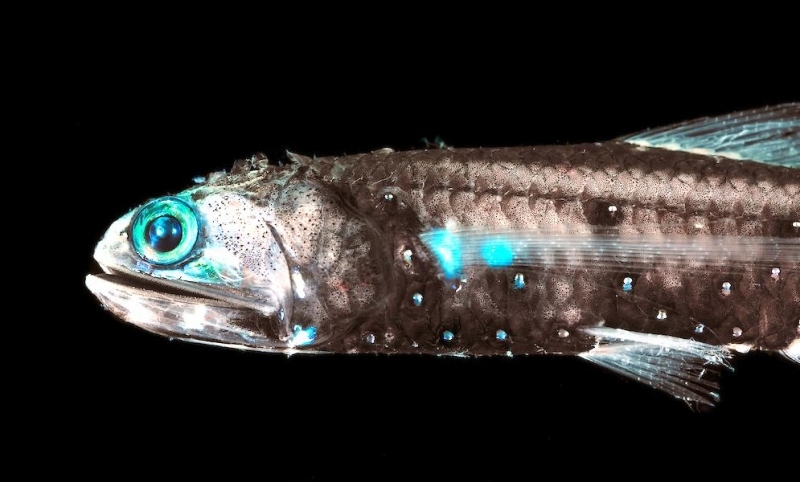 The body of the Lanternfish is covered with light-producing photophores. The arrangement of these lights varies by species. In some species, it also varies by gender. 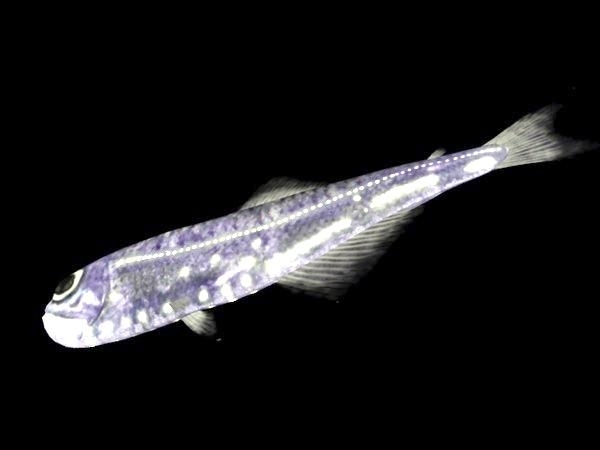 There is only one species of Lanternfish that is not capable of producing light. 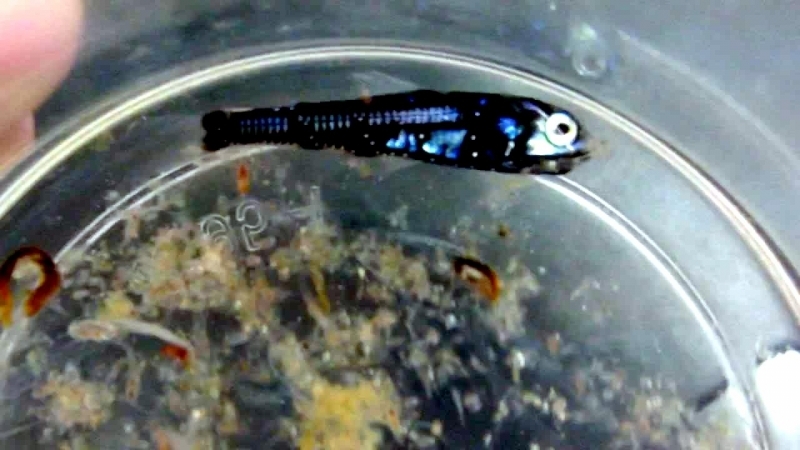 Lanternfish are known for their diel vertical migrations. 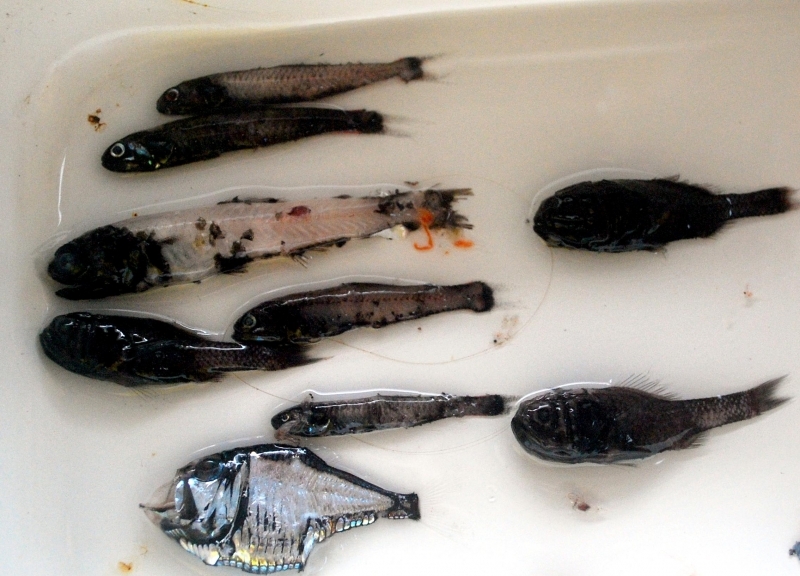 They spend the day in the deep ocean but come close to the surface at night in search of food. 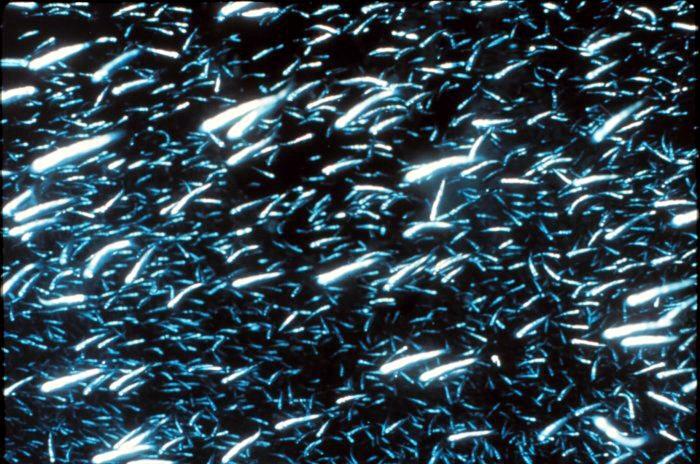 They do this to follow the similar migrations of plankton, which serve as their primary food source. 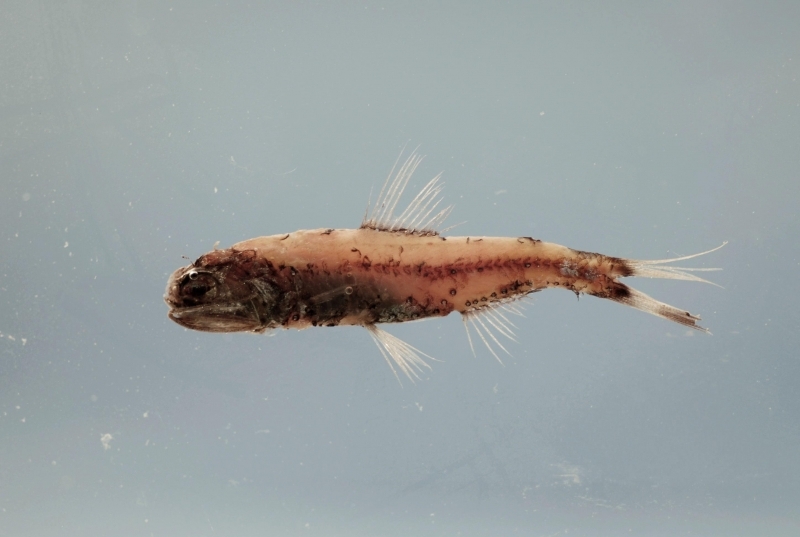 It is thought that these migrations may also serve to help the Lanternfish avoid predation. By returning to the deep-sea during the day, they avoid many of the large predators in the shallower seas. 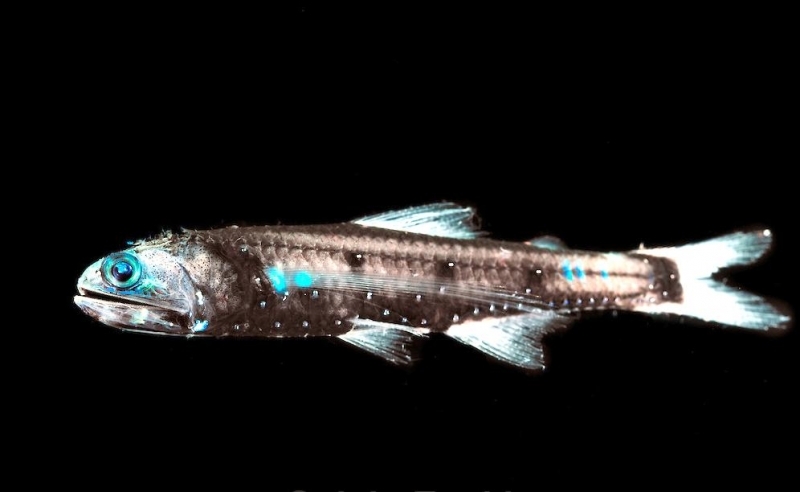 At shallower depths, Lanternfish provide an important food source to a number of organisms including whales, dolphins, tuna, sharks, seals, squid & sea birds. 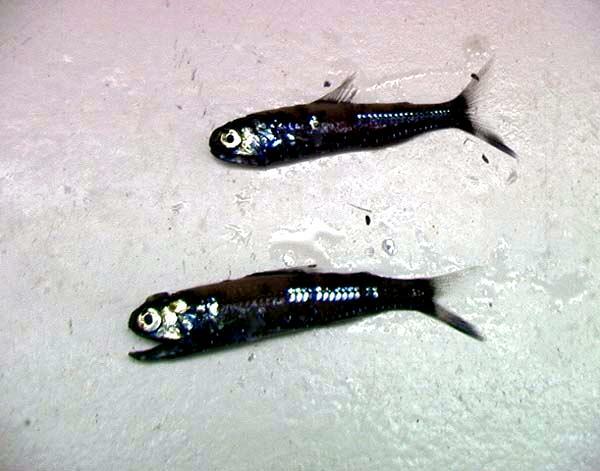 Lanternfish are known as non-guarding pelagic spawners. This means that the females release their eggs into the water column as a group where they are then fertilized externally by the males. 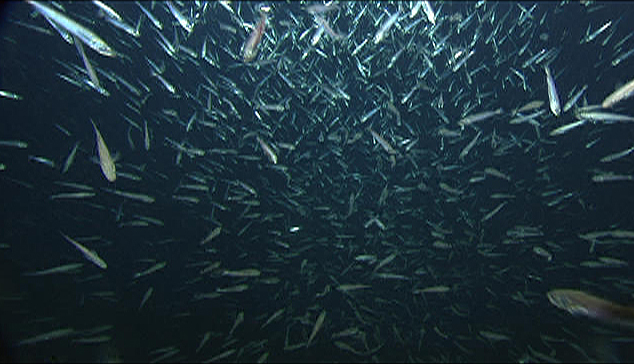 Depending on the species, between 100-2,000 eggs are released by each fish. Spawning is believed to occur year around in most species. Once the eggs hatch, the young larvae have a small number of photophores for producing light. They are left to fend for themselves until they reach maturity. 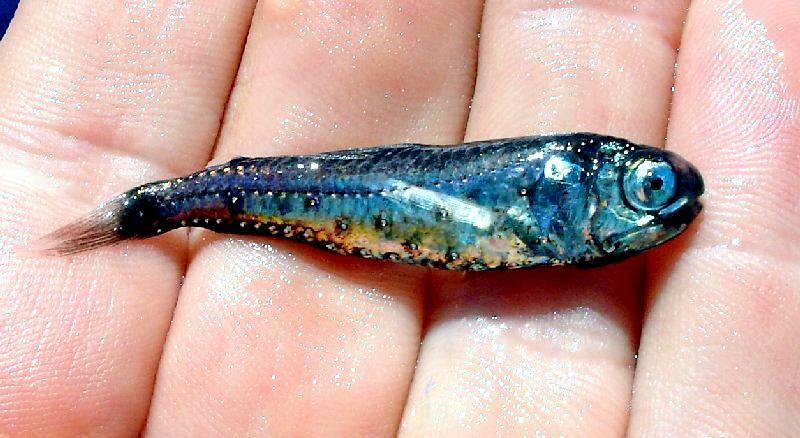 Lanternfish are so plentiful it is thought that their larvae may account for nearly 50% of all fish larvae found in the ocean. 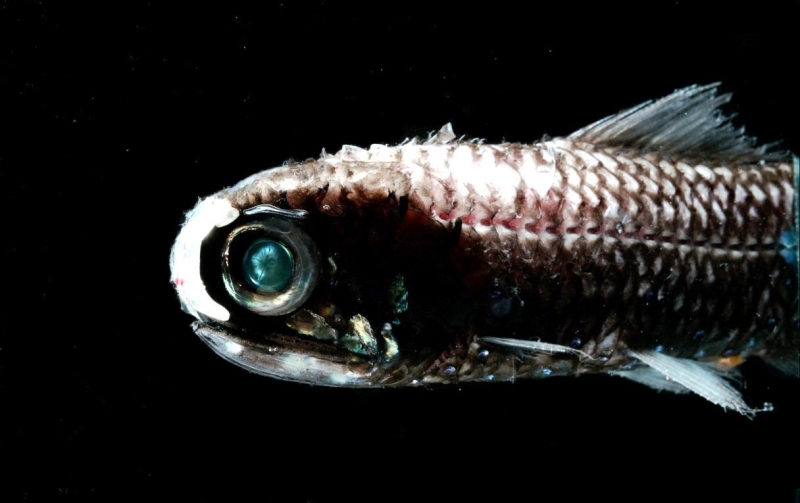 Lanternfish are found in all of the world oceans at depths ranging from 1,200-3,000 feet (about 360-900 meters). Most species prefer to remain close to the coast where they are commonly found in large schools near the continental slopes. 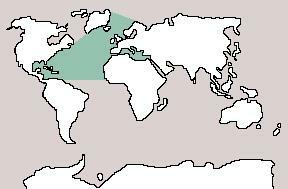 Different species have been known to separate themselves according to depth. They will form dense layers according to species. It is believed that this behavior is intended to reduce competition between species. 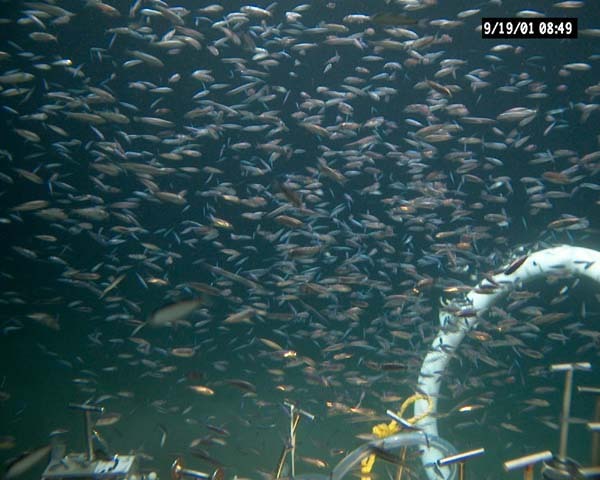 These layers contain so many fish and are so dense that they can actually be visible on sonar. They can reflect the sonar beams and give the impression of a false ocean bottom known as a deep-scattering layer. This phenomenon confused oceanographers for many years until the source was finally identified.